November is National Diabetes Month, which is fitting since we are entering the time of year when we tend to overindulge and gain weight. There is no better time to learn the risk factors and take action to reduce your risk or slow the progression of the disease. A whopping 79 million people in the United States have prediabetes, a condition in which blood glucose levels are higher than normal, but not high enough to be fully diabetic. Many don’t even know they have elevated blood glucose levels (“blood sugar”). In addition to increasing the risk of developing type 2 diabetes, those with prediabetes also face an increased risk of heart disease and stroke. This epidemic is due largely to the growing problem of obesity and a more sedentary lifestyle. The good news is that with the right diet and lifestyle changes, you can delay or even prevent diabetes from developing. Learning that you have prediabetes could actually help save your life if you take action and make the right changes. Prediabetes does not occur in those with type 1 diabetes. Type 1 diabetes typically occurs in children and younger adults and is an autoimmune disease. The body’s own immune cells attack the insulin producing cells in the pancreas. A person with type 1 diabetes makes no insulin at all and they must inject insulin daily to survive. Being physically active on a regular basis can help make muscle cells more sensitive to insulin’s action. It also aids in weight control. When you weigh less, insulin works better and keeps blood sugar levels in better control. Good nutrition is critical in getting elevated blood sugar levels back to normal. The following diet basics can help get you get back on track. 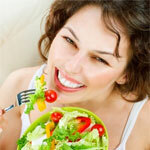 •	Eat 5-6 small meals per day and include a little protein, healthy fat and complex carbohydrate at each meal or snack. For example, breakfast could be a slice of whole grain bread with peanut butter, or an egg and a small banana. A snack could be yogurt and carrot sticks or almonds and an apple. Dinner could be a salmon steak with a small serving of wild rice and asparagus. •	Eat 2-3 servings of fruit and a minimum of 3-6 servings of vegetables per day. Fruits and veggies are rich in fiber, vitamins, minerals and phytochemicals and low in sodium and fat. A serving is one medium sized piece of fruit (think tennis ball), ½ cup of cut up fruit or vegetables, 1 cup raw leafy vegetables and ¼ cup dried fruit. •	Aim for 30 grams of fiber per day. •	Avoid products made with refined grains and white flour and limit intake of starchy vegetables such as potatoes and corn. •	Fill up on lower carbohydrate containing veggies: green beans, lettuce, tomatoes, cucumbers, celery, broccoli, cauliflower, cabbage, carrots, onions, water chestnuts, radishes, bell peppers, mushrooms, spinach, kale and other greens. •	Choose beans, lentils and whole grains which contain more fiber and nutrients. Brown rice and whole wheat pasta are better choices than white rice and pasta made from refined flour. Watch portion sizes. •	Choose fish and lean cuts of meat and poultry over fried and fatty choices. •	Include healthy fats from fish, nuts, seeds, olives and avocados. Limit intake of foods high in saturated and trans fats. •	No juices, regular sodas or other sugar-laden beverages. If you are overweight or have a family history of type 2 diabetes now is the time to visit your healthcare provider and ask them to check your fasting plasma glucose level (FPG). By being pro-active and making the necessary lifestyle changes you can prevent or greatly reduce your risk of developing diabetes.